Agnete Kjølsrud is best-known amongst metalheads for her part in the dreadful Dimmu Borgir single Gateways, but her appearance on Solefald’s Tittentattenteksti proved that the lady has talent, something also shown from her performance as frontwoman of Djerv. Something like the alternate gothic metal of the sadly defunct The Provenance with great big slabs of catchy groove metal added, Djerv take a catchy approach with Agnete’s freakish vocals atop providing an individualistic atmospheric punch. Don’t be put off by that groove tag, there’s guitar solos and everything, this album clearly and firmly in the metal sphere. And don’t be put off by memories of Gateways, for Agnete has a broad, talented voice, moving from nail-scraping screams to rather lovely crooning in the same track, bombastic opening Madman making good usage of both to keep your foot tapping along. The following Bowling Pin makes more usage of alt-rock guitar melody to provide variety, Agnete’s voice approaching a lilt at times with backing riot grrl bellows, and Headstone moves towards an enjoyable post-grunge stomp. It’s a well-rounded, professional formula that doesn’t take many steps away from the core sound – hear one track, and in some ways you’ve heard them all. Djerv are talented songwriters, however, giving each song a catchy hook and enough instrumental depth to avoid this being relegated to mere ‘commercial’ metal status. Having said that, some very, very slight hints of post-black instrumentation on Only I Exist aside, there’s little that would stop this getting mainstream attention alongside the likes of Skunk Anansie for rocking bands with distinctive female vocals. Perhaps not one for the most underground of metalheads, then, but certainly something worth wrapping your ears around if you’re a fan of female-fronted metal in general. 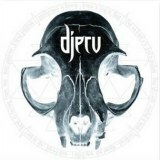 Djerv is an impressive that deserves to find the band fans, now let’s see if they can develop into something truly remarkable.